From textbooks to westerns, Native American history and culture has often been reduced to stereotypes. Today, we’re breaking down the most pervasive myths about American Indians, including their role as welcoming host at Thanksgiving. Then, we'll tackle an issue many of us will face when getting together with our families tomorrow: passive aggression. Plus, the crew revisits the tense dinners of holidays passed. Here's how Native history reads for many Americans: Indians welcome pilgrims at Thanksgiving, tribes are sent west on the Trail of Tears, lots of fights with cowboys, reservations, casinos, and now fighting the American government again over an oil and gas pipeline out west. That leaves a lot of holes that get filled in with stereotypes, prejudice, and myths that have misinformed generations. Roxanne Dunbar-Ortiz and Dina Gilio Whitaker have written a new book to dispel them, "All the Real Indians Died Off": and 20 Other Myths About Native Americans. 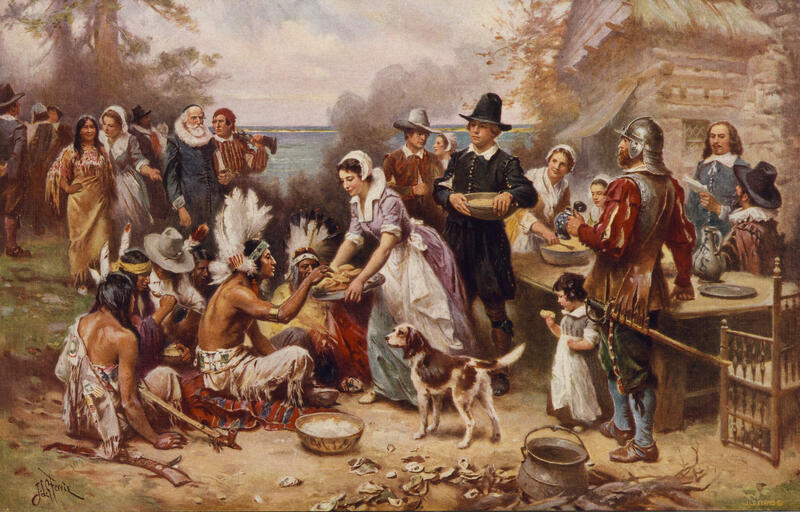 One of the most prominent myths in American culture is about that first rosy Thanksgiving between the pilgrims and Indians, that, well, probably didn't happen the way your elementary school staged it. For one Virginia tribe though, this Thanksgiving marks the end in a very long fight for recognition. This story comes to us from John Last with support from the Virginia Foundation for the Humanities. The holidays are on the horizon - and that means all across the country, people will be awkwardly avoiding, or actively engaging in discussion about the recent election. Gathering so family and friends can be great - but when personalities collide, it can be hard to know how to handle hidden tensions that may be simmering just below the surface. We spoke with Loriann Oberlin, therapist and co-author with Tim Murphy of Overcoming Passive-Aggression: How To Stop Hidden Anger From Spoiling Your Relationships, Career, And Happiness for some tips. But first, we wanted to get the gang together to talk it out here in the studio, and steel ourselves for holiday gatherings. Tomorrow is Thanksgiving. A time to gather with family, give gratitude, and eat turkey...lots of it. But before you carve your bird, stop for a moment to honor its sacrifice. Scott Carrier brings us the story.